Chile's Patagonia, a wild and rough place on planet Earth has been for a long time known only to real adventure seekers and outdoorsy enthusiast. Nowadays, the region awaits with open arms even those travelers who until recently rather admired nature from a safe distance. But it is hard to resist the Chilean picturesque landscape consisting of fjords, dense forests, snow-capped mountains, glaciers, and crystal clear lakes or speed rivers just to name a few the most shining features. Carretera Austral is a scenic road in Chilean Patagonia, where you can experience it all. The road connects the southern, remote and difficult to access places with the rest of Chile and allows all travelers and visitors to see the beauty around. The scenery along the road is incredibly diverse, and road tripping Carretera Austral will allow you to travel through one of the world's most awe-inspiring and jaw-dropping places only in a couple of weeks. We spent two weeks on Carretera Austral, and here we bring our guide which includes all the topics you need to know before you go and explore by yourself. The history of the road goes back to 1976 when the construction was commenced under the dictatorship of Augusto Pinochet who gave an order to connect remote villages and communities in the Southern Part of Chile. Having a road became extremely important as back in the eighties some parts of Chile had been still accessible only by boat or plane, but given the harsh winter weather conditions, it very often happened that people remained without the possibility to move around or without food supply for days. Of course, this can happen even nowadays, but thanks to the road the risk is lower. Also before 1976 when traveling by land, a big part of Chile had been accessible only via crossing borders to Argentina and back which became a problem when those two countries had territorial disputes (which almost led to war), and Chile needed to strengthen the presence in those remote areas. Constructing Carretera Austral, also known as Southern Road or Chile's Road 7 is not an easy task because of fjords, thick forests, glaciers, and mountains standing in the way. This is also the reason why a big part of the road has not still been paved yet even after more than 40 years after commencing the construction (as of 2019, the asphalted road stretches as far as Villa Cerro Castillo). Carretera Austral is 1240 kilometers long and stretches from Puerto Montt to Villa O'Higgins. I haven't done much of research about the actual road condition prior to our trip and was quite surprised how the road looked like. To illustrate the current state of the Carretera Austral, I'll give you a few examples. As of 2019, the first fourteen kilometers from Villa Cerro Castillo to Puerto Rio Tranquilo (visit the impressive Marble Caves) has been under construction, the rest of it, which is about 100 kilometers is an unsealed road. The next part to Cochrane, which stretches around beautiful Lake Carrera General, where you can visit fascinating Marble Caves, is completely unpaved and the unpaved road generally continues to the end of Carretera Austral and the last village on the road, Villa O'Higgins. Despite the popularity, the process of construction is ongoing, and there is a big chance you will experience some delays. Patagonian weather is so harsh that there is no other time to repair the road than during summer when the snow is gone. If you are renting a car, no worry as all rental companies know that 99% of their customers want to drive Carretera Austral and most of all cars are completely suitable for it. If you are planning to bike, be prepared that due to road conditions described above, it takes longer to bike Carretera Austral than any other asphalted road, also the ubiquitous dust and wind make the ride a bit harder. When it comes to accommodation along the road, you have three options: camping in the tent, sleeping in the camper van or staying in hotels. Camping is a great way how to save some money (although it is not free), and there are lots of campgrounds along the way. You can find a camping spot in every village (or in between), and it is unlikely to find a campground without spot available even in the high season, which makes this option even more attractive. Make sure you have a waterproof tent and warm sleeping bag as it rains a lot, nights are cold and the a once in a lifetime adventure can easily turn into uncomfortable and wet experience. Sleeping in a camper van is very similar to sleeping in a tent (it is slightly warmer and more windproof though), so think ahead if this is the adventure you are looking for. We met a couple of people who did not expect that Patagonian summer can be that cold and windy, and although they paid for camper van around $120 per day, they at the end slept in the hostels because it was more comfortable. The last option when traveling along Carretera Austral is to sleep in hotels, hostels or hospedajes (home stays). At first, when we saw prices of accommodation online we freaked out, but fortunately, later we found out, that many local hospedajes are not bookable online and it is easy to get an acceptable price when asking around; villages on the way are small, so you don't need to be worried that you will spend a lot of time by looking for an accommodation. Our tip is to book one hostel or hotel online to have at least something in hand just in case all cheap options are fully booked. Because we are traveling on a budget, we do not expect luxury, but all places where we slept were comfortable, clean and had the only three things we required: hot water, kitchen and wifi (the quality was very often poor, but ok when we consider the remoteness of the area). Carretera Austral is a popular tourist destination in Chile and hotels can fill up quickly in high season. You can check hotels availability via our Booking.com affiliate link. If you make a reservation through our link, you support our work, as we earn a small commission with no additional cost to you, and we can keep providing you with a free content. We handpicked the best accommodation along the way and you can find our choices below. Chaiten: Paraiso Patagonico - Kind and welcoming host, clean rooms, renovated bathrooms with hot water, and good Wi-Fi for an affordable price. Puyuhuapi: Cabana Turin - Spacious rustic wooden cabins that will make you feel like at home. You will also find a kitchen in this accommodation where you can prepare your own meals. Coyhaique: Raices Bed and Breakfast - One of the top picks situated in the heart of Coyhaique. Quiet rooms, comfortable beds, helpful staff, and homemade breakfast. Puerto Rio Tranquilo: Cabanas Don Hugo - Clean and cozy cabins, well-equipped kitchen, wood-burning heater, and the host will help you arrange a tour to Marble Caves. Cochrane: Hostal Lejana Patagonia - Warm and clean rooms, friendly host, and good kitchen. Villa O'Higgins: Robinson Crusoe Deep Patagonia - Lovely lodge, comfortable, bright and clean rooms. Helpful staff, beautiful common room. The breakfast is included. Again, you have three options. Hitchhiking, public transport, and car rental. Hitchhiking is the least reliable option, and you should do it only when you're not on a tight schedule as it can happen that no one will give you a ride the day you decide to try out your luck. Also, at some places (for example in Villa Cerro Castillo) the competition among hitchhikers can be immense. We used this type of transportation only on short distances when we needed to get to national parks without shuttle buses between destinations and so on. Overall hitchhiking in Patagonia is very safe and local people (tourist not that much) are used to take hitchhikers. We used public transport most of the time when traveling along Carretera Austral and never had an issue. Always, when you arrive at a new destination, ask around to immediately find a bus schedule, so you know when the next bus comes (it is also better to make a reservation straight away). It can also happen that the bus is full, especially in the main season, and because at some points buses go only two times or three times a week, locals sometimes take precedence over tourists. Public transport usually runs quite frequently between December and March, off-season the buses are more sporadical so plan accordingly. Prices for buses are relatively higher around CLP 10000 for a three-hour ride, but some routes are subsidized by the government and you'll be able to lock surprisingly good rate. Car rental is the most convenient but also the most expensive way how to explore Chilean Patagonia. It gives you the freedom to stop whenever and wherever you want, and you don't have to be dependent on bus schedules or the mercy of others. The only downside is the cost, and also the fact that you can't return the car at the end of Carretera Austral in Villa O'Higgins. You must either drive the same way back to Puerto Montt or Puerto Varas (some companies have drop off points on Carretera Austral in Coyhaique which is not even in the middle), or you can cross borders to Argentina and then back to Chile to hike in Torres del Paine, but expect to pay a steep one-way fee (around $500), more expensive insurance and a fee for travel document allowing you to drive in Argentina. Remember that when traveling Carretera Austral, cash is the king. You can find ATM right at the beginning in Puerto Montt and Hornopiren, then in Chaiten, later in the biggest city on the road Coyhaique, and almost at the end in Cochrane. At some places, it is possible to pay with a credit card (especially in the better hotels and restaurant) but always make sure what are your bank fees so you won't recklessly loose money. You can also exchange money in the towns mentioned above, but to our surprise, it is easier to change dollars or euros than to get Argentinian pesos. We tried to get Argentinian pesos in Coyhaique, but the exchange rate was so disadvantageous that we gave up. Don't rely much on your dollars as it is not a rule that the property will accept it because of the unfavorable exchange rate. The road is more than 1000 kilometers long (from Puerto Montt to Villa O'Higgins it is exactly 1240 kilometers) and stretches through spectacular and remote landscapes in Patagonia. The big part of the road is still unpaved so do not think you'll be able to travel the Carretera Austral in two days (and we don't even see a single reason why you would want to). Along the way, you will find several villages or small towns approximately every hundred or two hundred kilometers to break your journey. Coming from Puerto Montt you have two options on how to get to Chaiten, and both of them include a ferry. The overnight direct ferry takes about 11 hours, you sit on reclining seats, and it goes three times a week, so you need to plan ahead. Or you can drive by car, but this option also includes multiple transfers by ferry. You can read more about the transport options in our article about Pumalin National Park near Chaiten. In case you plan on getting to the southernmost village on Carretera Austral, Villa O'Higgins, you need to take a ferry which operates between Puerto Yungay and Rio Bravo. The ferry takes 50 minutes, runs for free and in the season goes three times a day each direction. If you don't want to drive to the shining star of Chilean Patagonia, Torres del Paine National Park via Argentina, you need to take another ferry which goes from Tortel to Puerto Natales and takes three days so you will have plenty of time to admire the surrounding landscape. If you travel only in Chile and plan on doing Carretera Austral, your starting point will most likely be the northern tip of the road, a port town with a characteristic name, Puerto Montt and you will head down south (we met several people traveling in the opposite direction, but all of them arrived in Chile from Argentina). The road ends after 1240 kilometers in the small village called after Chilean liberator Bernardo O'Higgins, Villa O'Higgins or simply Villa. You can also rent a car or get on the Carretera Austral from Puerto Natales or Punta Arenas in the south of Chile, but to get there, you must travel through Argentina and cross borders at Chile Chico. Carretera Austral is a one-way road in Chile, and there are no borders crossings directly along the way. It starts at Puerto Montt and finishes in Villa O'Higgins, which is also the end of the road. But of course, it is possible to cross borders to Argentina you only need to leave the Carretera Austral at some point and make a short detour to get to Argentina. The most common and popular way among travelers heading to Argentina is crossing the border at Chile Chico. It is 'only' 400 kilometers from Villa O'Higgins, so you don't miss much when not driving to the very end, and you can cross borders here either by car or public transport. Other, not that popular places where you can cross the border with a car are Futaleufu or Balmaceda, but they are almost at the beginning of Carretera Austral. In case you are heading to Villa O'Higgins by car, you need to, unfortunately, turn at this point and drive back to Chile Chico to cross borders, but for those traveling on foot or on the bike, there is another but the more spectacular option how to get to Argentina. From Villa O'Higgins, you can take a bus to a port Puerto Bahamondez where you'll take a three-hour ferry to Candelario Mancilla. From this point, you must walk 22 kilometers to Argentinian Border which is located on the shore of Lake Desierto (you can arrange transport by car for the first 15 kilometers, bikers must dismount the bike for the last 5 kilometers). Here you must jump on another ferry which will take you across the lake in about 50 minutes (or walk around the lake, but you must have a tent as this is not doable in one day) and after get on a bus which will finally deliver you to the final destination in Argentina, El Chalten. It is a long but completely astonishing day and the best borders crossing we've ever done. The best time to visit Chilean Patagonia is from November to March when the road conditions should be in its best, the weather is usually the most stable with predominance of sunny days, public transport runs more or less frequently (at least it is much more frequent than during the rest of the year) and all accommodation along the way are open. The biggest downside is the prices because when Patagonia is in its best, prices of all services are the highest. Because of that fact, all budget orientated travelers should consider visiting the area in should season such as October or late March and April when the craziness ceases and photographers will be able to enjoy color contrasts between blue lakes, white glaciers, and red colored tree leaves. Winter in Patagonia (June to August) is the most challenging time to visit, but if you're an outdoor enthusiast with some experience, this might be a great adventure for you. Fewer crowds, low prices and a landscape covered with snow and ice will allow you to see Patagonia from a different perspective. The internet connection varies from place to place. Sometimes it was impossible to use, but sometimes we were surprised how fast and reliable the wifi was, especially when we realized where in the world we are. In Puyuhuapi I was able to backup all my photos from two previous months to the cloud storage, in Cerro Castillo, I couldn't even check my email or read any news. But to my surprise, the internet speed was most of the time better than what I expected. If your work is internet dependent, you can contact the accommodation and ask them about the strength of the connection, before you book the room, but be prepared they will always tell you it is good. Cell phone coverage along Carretera Austral is decent: it works without any problems in all towns or small villages. Farther from the main road you go (for example during the day or multi-day trips in national parks) the weaker cellular coverage is. You can find several restaurants in every village along the way (the quality varies a lot), so there is always a place, where you can go and eat, which should appreciate everyone who's not a fan of cooking on holidays. The prices are a bit higher than in the rest of the country, but it's the tax for being in such a unique area. In every town, even in the smallest village along Carretera Austral, you won't have a problem to find grocery shops. We were pleasantly surprised that the food in small stores wasn't that overpriced as we expected (everything in Chile was much more expensive than in the rest of South America). Now, when we traveled along the Southern Road, we fully understand that all items in the shops cost more as the area is so remote, and some places are hard and time-consuming to reach. You can buy almost everything only fresh food is often hard to get, especially vegetables and fruits, if available, are usually in a bad state. Brings your own medications as there are no specialized pharmacies in most of the villages. In case you need something from the pharmacy, or you need to restock food for multi-day hiking or to buy some new clothes, your best bet is Coyhaique, the biggest city on the Carretera Austral. Patagonia was the first place in South America where we drank tap water. Always ask in your accommodation, but water is generally safe to drink as it comes from the surrounding mountains. Drinking tap water is not only a great way how to save money but also an option how to become a responsible traveler who uses plastics only when absolutely necessary. Packing for Carretera Austral and Patagonia overall might be a little bit trickier than you think. What you need to pack, of course, depends on the time of the year when you are going to visit the region, but you can take some things for granted. First, it's going to be cold and windy, even in summer (summer is the windiest time of the year). Second, it can rain a lot anytime. And the last weather feature, the sun can be pretty strong even when it's cloudy. Wind stopper and waterproof jacket are the most important items you should bring to Patagonia with you. We like to wear multiple layers of clothes which allows us to quickly react to constant weather changes. Functional thermo wear, sturdy hiking boots, hat are among other important things you should pack. Also, no matter how high quality your hiking gear is, we still think that no one has yet invented anything better than plastic rain poncho. Strong sunscreen and good repellent against 'tabanos', Patagonian mosquitoes, also known as horse-flies, is a must. There are plenty of gas stations along the way, only make sure you have enough gas to reach the next one. When in doubt, ask the locals if the next village has a gas station and what are the operating hours as they do not run non-stop. The prices are competitive and not much higher than in the rest of the country. In January 2019, one liter of gas cost around CLP 1000, even in the most remote place, Villa O'Higgins. Chile is the most developed country in South America, Chilean Patagonia and Carretera Austral belong among the most touristy destination, and this fact is reflected in even higher prices, although the service and quality are not very often better than in the rest of the continent. Combine it with a Patagonia's remoteness, and you can tell this will not be a typical budget-friendly trip. It is hard to say how much exactly you will spend when traveling along Carretera Austral, as it depends on your travel style budget and preferences, but we can try to give you an idea. There are still ways how to reduce the cost of travel such as hitchhiking, sleeping in a tent or cooking your food. Expect to pay CLP 8000-15000 per person for a bed in a dormitory or for a private room with shared bathroom, the mid-range accommodation cost about CLP 50000, and if you like to stay in something nice(r), it can cost more than CLP 300000. Meals in a restaurant start at CLP 10000 while for the same price you can do shopping in a grocery store for a dinner for two. 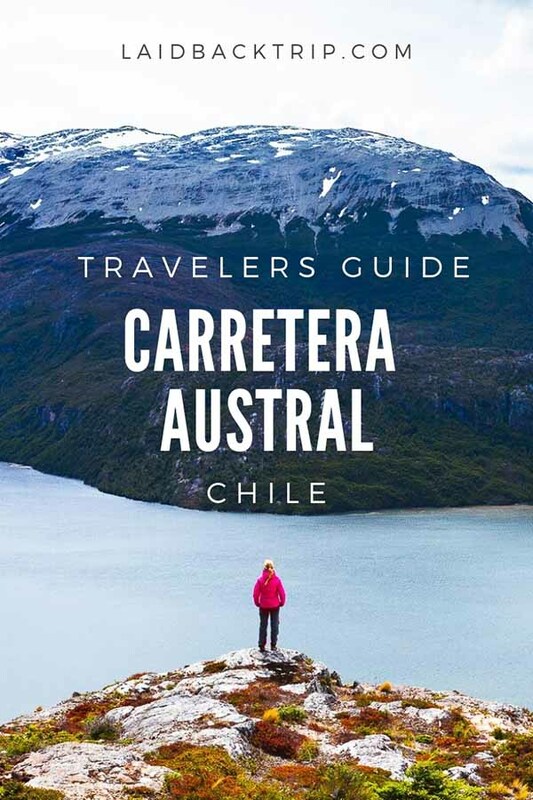 Despite the fact that Carretera Austral is a popular and well-known destination among travelers from around the world, the language barrier is still prevalent, and you better learn some Spanish basics at least to be able to find an accommodation and buy some food in a grocery store. The road consists of small settlements and villages where it is very rare to find people speaking at least basic English. Your best bet is to find a person working in the information center, they are usually helpful and speak English alright or to download a translating app. Weather in Patagonia can be unpredictable and changeable - it is no exception to experience all four seasons in only one day. Generally, the best time to visit south of Chile is during summer which lasts here from December to March. During this time the weather is more stable, temperatures are higher, and most of the trails are walkable, and you should be able to enjoy a pleasant time in Patagonia. We traveled along Carretera Austral in late December and beginning of January, and although we cannot complain about the weather, we must say that we didn't expect two things. Such low temperatures during the day (it gets even colder when you travel more south) and the strong cold wind which picks up especially later in the afternoon. Winter in Patagonia lasts from June to late August, and not many people visit the place during that time not only because the weather can be really harsh but mostly because the road might be impassable. The most beautiful photos, according to our opinion are taken in autumn. Leaves on the trees change colors, and it contrasts with white mountains and glaciers around. Temperatures are getting lower by that time and precipitation increases. Weather during spring can be even more unpredictable that during the rest of the year. Road conditions depend on how harsh and snowy the previous winter was, but it must be surely amazing to watch how nature wakes up. Autumn and springtime is also a good time to visit for all who want to travel Carretera Austral on a lower budget. You'll see fjords, active volcanoes, snowcapped mountains, glaciers, dense forests, meadows, and nothing can prepare you for the scenery you're going to travel through as it is just breathtaking. Patagonia offers one of the most remote travel experiences in the world and is a paradise for everyone who enjoys outdoor activities in its raw form. It is a place where nature stands above everything, time flies in a different, much slower pace and nothing is a problem. A local adage says that those who are in a hurry don't go far and we think it truly fits. South America has not the best reputation when it comes to travel safety, although some destinations are for sure better than others. Patagonia and Carretera Austral belong among the safest places not only in South America but also on planet Earth as crime is almost nonexistent. Most of the times we didn't even get any key to our room, and when we asked for it, we got the only short answer. There is no key, you arrived down to the south and things are different here (well, we are not those who light headed leave our belongings in the unlocked room, but as we did not want to hike with two laptops and a spare camera, we had to leave it in the room, and were always relieved that we found our room untouched). It took us 14 days to get from Puerto Montt to Villa O'Higgins using mostly public transport and hitchhiking. We think that seven days is a bare minimum to get the feeling of this Chilean nature wonderland, have enough time to travel from one place to another and do some one-day activities. Lots of people arrive solely to Carretera Austral to do serious hiking and camping in the area and not even two months are enough time for them to see all the highlights. Renting a car is something you should consider when short on time as it allows you to spend your time more efficiently. It is also better to have one or two days extra on your itinerary for unexpected situations or whims of the weather. Hiking, kayaking, rafting, mountain biking, fishing, horseback riding, glacier ice climbing, scenic flights. The possibilities of activities you can do along Carretera Austral are almost endless, and if you love outdoor adventures, this is the place to go. But the great thing about this road trip is that you can even stay in the car all the time and enjoy nice views from the safety of your four-wheeled friend. How amazing is that? Patagonia is home to smallest deer in the world, Andean wild cats (pumas), and many birds specious. Animals are shy though, and an encounter for example with a puma is extremely rare (in case you will be that privileged, do not turn your back to puma, shout and try to make yourself look bigger). At some places, you can arrange wildlife spotting tour with a tour operator to get closer to nature. And unlike in the USA or Canada, there are no bears which made our outdoor adventures definitely more stress-free. There aren't any multi-day entry passes which means that every time you want to visit national park along Carretera Austral (even the same one two days in a row), you have to pay the entrance fee. Be prepared that foreigners pay almost double what Chileans do. There are some exceptions, and for example, in Pumalin National Park or Patagonia National Park, you don't need to pay any entrance fee. Those parks are fairly new and want to attract new visitors. We say this is another reason why to stop by. The first thing we noticed was that public transport along Carretera Austral is quite expensive. Some routes along the road are subsidized by the government to encourage locals to use public transport, but the favorable price is valid for travelers as well. For example, we paid CLP 10000 per person for 2.5 long ride from Puerto Rio Tranquilo to Cochrane, and CLP 7000 per person for 7 hours long ride from Cochrane to Villa O'Higgins. As you can clearly see, the difference between prices can be pretty big. Also, some buses between villages don't go every day, so it's better to check the schedule at the terminal upon your arrival. The quality of public transport varies from small vans without any leg room to nice and comfortable big buses with heating and reclining seats. Every town or village has an information center, and usually, it's the best place where to start looking for most up to date information (except for this blog post, of course). Also, local travel agencies can help and provide you with everything you need to know about the place. We usually slept in local hospedajes which are not on booking sites, didn't reserve anything in advance and just asked around when we arrived and never had any problems with finding vacant rooms even in the high season. You might need to book in advance only if you want to stay in better-looking places which are possible to reserve online as they tend to fill up quickly and rates increase closer to arrival date. We would recommend you to book the bus tickets in advance though as we've met some people who couldn't get on the bus when they appeared at the station without a ticket. Also, some of the ferries are better to book in advance as they don't go often and the spots can fill up quickly. Carretera Austral has lots of activities to offer for everyone and depending on your preferences you can create your perfect itinerary. Do you love hiking? Don't miss Villa Cerro Castillo lagoon hike on your way. Are you into rafting? You can spend days on a river near Futaleufu. Here's an idea of how to build a sample of your itinerary for Carretera Austral. We arrived from Puerto Montt to Chaiten, where we spent two nights visiting and hiking in Pumalin National Park. From here we continued to Puyuhuapi, the closest village to Queulat National Park, home of famous Hanging Glacier. The next stop was Coyhaique, the biggest city on Carretera Austral only to change a bus to Villa Cerro Castillo, where we spent one of the nicest days on Carretera Austral when hiking to the famous lake with towering mountain Castillo behind. Then the road took us to Rio Tranquilo, a place famous for Marble Caves or glacier hiking. After one day, we carried on to Cochrane, the nearest town to newly established Patagonia National Park, an area where we did 32 km long hike and did not meet a single person for the whole day! The last destination was Villa O'Higgins, an official end of the road. From here, we crossed borders to El Chalten, Argentina, where we continued in exploring one of the most beautiful landscapes in the world, Patagonia. And when short on time, what are places you really shouldn't miss when road tripping Carretera Austral? Among our favorite places belong Pumalin National Park, Villa Cerro Castillo, and Villa O'Higgins! If you've made it to the end of this post, we can't be happier. We hope you've found here all answers to your questions about traveling Carretera Austral, but in case we did not mention something you're curious about, do not hesitate to comment under this post. Every feedback is much appreciated!